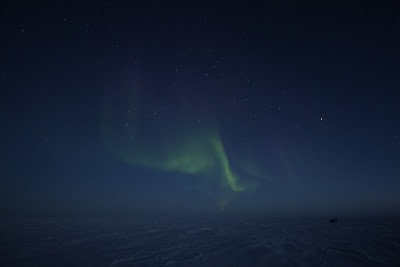 Sometime about a week ago, it finally got dark enough outside for auroras to start showing themselves. Since I'm outside for at least an hour every day wandering back and forth between the station and DSL, I've been lucky enough to catch them fairly regularly. They began last week, as vague whitish-green patches, slightly lighter than the surrounding sky. 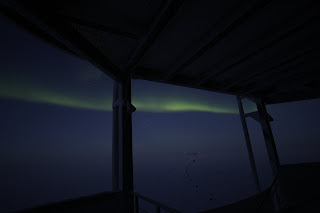 I only realized they were even auroras when one suddenly shifted shape, then vanished. 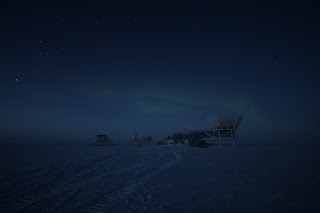 Over a couple of days, these blobs of faint light evolved into distinctly green ribbons floating across the sky. Early this week, we had our first real show. I was leaving the station to hike back to DSL after lunch, but was stopped by a surprisingly bright band of green across the sky. I paused on the stairs to take photos, and instead of quickly fading away like all the other auroras I've seem so far, it started to dance. I ran up to the observation deck on top of the stairwell, and stood to watch. Auroras put on a really neat display - dozens of distinct branches constantly growing, fading, waving and undulating across the sky, all with astonishing grace. After a while, I was surprised to find myself listening for some sort of noise to accompany the visual feast. Of course, auroras are silent, but I caught myself honestly believing that it should have been making some sort of sound. It just seemed so incongruous to have such an amazing display appealing to only one of the senses. In any case, I can't wait for it to go fully dark outside, when the multi-colored auroras will finally show themselves. Aren't they something? I found a time-lapse on the Antarctic Sun after reading your post. Students will remember the scene from 10 Below with the dogs dancing in the lights. I'll show your photos to them tomorrow. Keith, Thanks for the posts. I have been following your stories since you started and have really been enjoying your writing and photos. You parents were over for a visit Saturday and I was able to show them a video interview that was done before the summer crew left.